Statechart diagrams represent the possible states and transisitions of instances of a specific class. Sequence diagrams show example sequences of messages sent between instances. Sequence diagrams show instances in columns and messages in rows with time increasing down the length of the page. Collaboration diagrams also show example seqences of messages sent between instances. But they number the messages. The diagram can be laid out any way you choose. These elements are described in Fowler chapters 5, 8, and 9. State diagrams show possible behaviors of instance of a class. If there is more than one transition out of a state with the same event and both conditions can be satisfied, the behavior is ambiguous. Activity diagrams show a wide range of interactions between the system and users or other actors. Much like a state diagram, but drawn like a flow-chart. 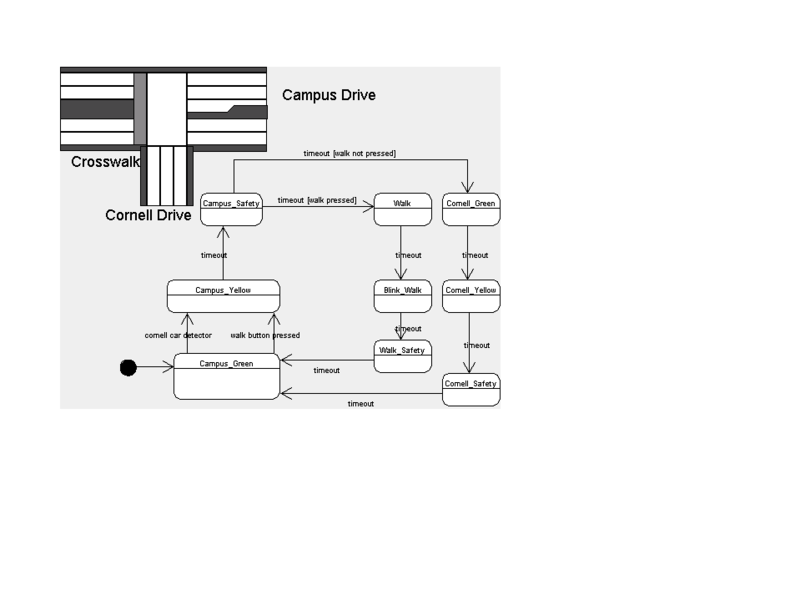 You are more likely to use fork and join in activity diagrams because the activity describes both the system and other actors that work in parallel. Do not normally use composite or concurrent states. Activity diagrams are used during requirements gathering and are usually not as precise as design diagrams. 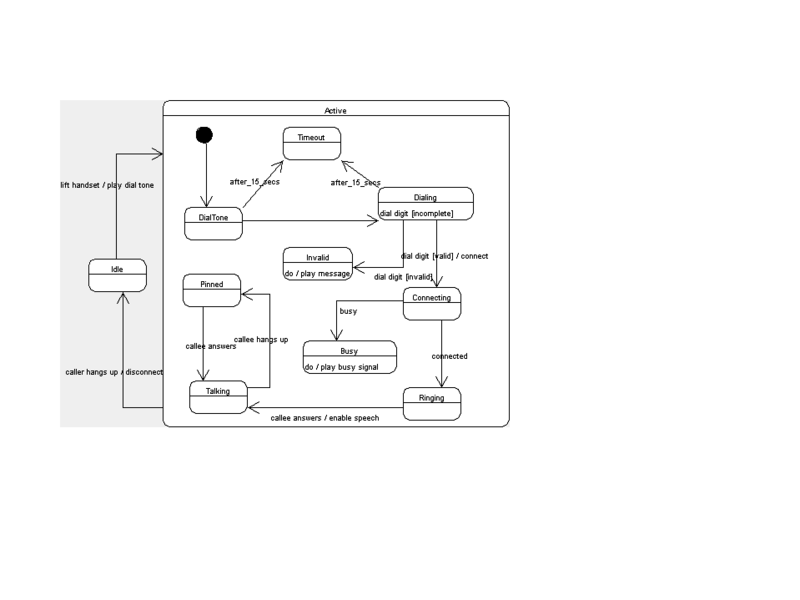 In contrast, a use case describes one specific path through an activity diagram. Activity: Capsule shape with name of activity. Otherwise just like a regular state. Transition: A solid line with a stick arrowhead. Just like a regular tranisiton. Branch pseudostate: large white diamond. Logically like an if-statement or case-statement. The branch is actually a mid-point on a transition. The overall transition can only be followed if both the transition into the branch and one out of the branch can both be followed. A merge or junction is be used to end the if- or case-statement. Fork and join: thick black bars. Allow multiple activities to be carried out at same time. Joins wait for each "thread" to complete. Collaboration diagrams show one example of how instances exchange messages to implement a use case. Boxes for instances. Names are underlined. Arrange the instances on the page any way that you like. objectName: name for this particular object. Rarely used. RoleName: the role that this object plays in this example. Two different instances of the same class may play different roles in one collaboration. E.g., two instances of class Person participate in a traditional marriage, one plays the role of Husband, the other Wife. BaseClassifier: the class of this instance. linkName: name for this particular link. Rarely used. RoleName: the role that this link plays in this example. Two different link of the same one-to-many or many-to-many association may play different roles in one collaboration. BaseAssociation: the association of this link. Messages are numbered. The sequence of messages describes how the system will process the use case. The most common type of message is one instance calling an operaion on another instance. Sequence diagrams show how the system will implement a use case. But, unlike collaboration diagrams, the sequence of messages is shown by the vertical position on the page. Each ClassifiedRole is one column. Each message is a horizontal line that goes from one column to another. Links are not shown, only implied by messages. See demonstration in lecture or diagrams in books or on the Internet.